Being a parent can be challenging, and being a parent who’s also disabled can present additional challenges. Slings can go a long way to providing disabled parents with a solution to some of these challenges. If you use a wheelchair, either exclusively or partially, transporting your child around with you can be difficult. Using a sling to carry your child whilst using your wheelchair can provide a secure way of getting around knowing your child is safe and happy, leaving you to get on with your day. Slings can be used facing in or out, more on your hip or completely on your front. 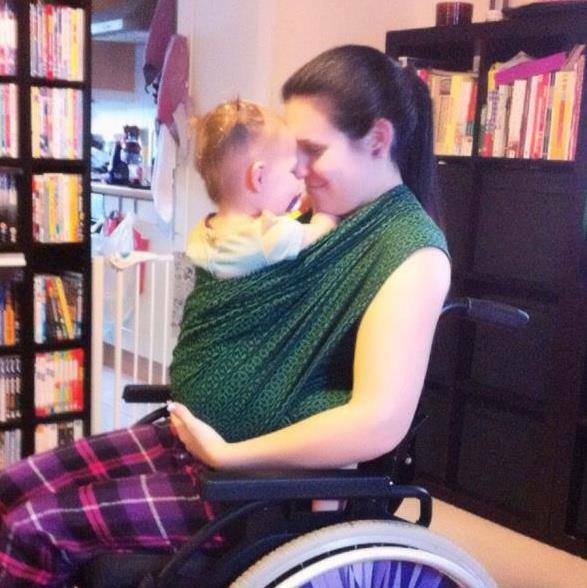 Slings can be strapped around you, or you and your wheelchair. Many different slings are available to suit a variety of preferences such as structured, soft, wraparound or clip on. If you have limited mobility or partial use of your limbs, there are many slings available that can be secured with just one hand giving you the freedom to get on with your day knowing your child is secure and safe. Parents and carers with hearing or sight impairments could find a sling very helpful. Having your child close to you in a sling means you are able to always be in-tune with their needs. You can get around knowing your child is safe and secure. There are just a few of the examples, every situation and disability are different, but there are many types of sling so we will always find something to fit your circumstances. Mum to N aged 2.5 years. When did you start using slings & why? From newborn. I had an c-section due to all my medical problems but as soon as I had recovered from that I had to figure out a way to transport us both when I was on crutches or in the wheelchair, you can’t push a buggy then! In the wheelchair sure I could hold her if someone was pushing me, but what if I wanted to push myself? I shouldn’t be denied independence because I have a baby right? Like most people I started with a bog standard high street carrier, I hated it, it literally hurt every part of my body even after the shortest period wearing it. I moaned about it to a friend who immediately lent me her strechy wrap and I never looked back. How has using a sling generally benefitted you and your child/ren? There are so many ways in which slings have benefited both of us. I don’t think I can even count them all. I have quite a few health problems but the main ways I am affected is with pain in muscles and joints, weakness in my muscles and exhaustion brought on by even the smallest of activities. For the first 4 months of her life Niamh did nothing but scream, at 4 months we finally managed to see a paed and she was diagnosed with silent reflux, she was medicated for it and the change in her was amazing. She still had flares and for this reason she was much more comfortable upright, it used to sooth her instantly. Now with my pain problems, muscle weakness and exhaustion holding her upright for the majority of the day was physically impossible. Slings allowed me to do this, I felt like I was helping my daughter, being a good mum and no being hindered by my illnesses and having to have someone else do the work. As she got older and didn’t need to be held upright so often she was the worst child for naps and was seriously cranky when she was tired, slings to the rescue once again! Slings have allowed me to have independence where I might not or in some situation would not have had any. It has allowed me to be her mother and the sole person looking after her, not passing her to other people. And the last and possibly most important benefit is our relationship, myself and my daughter have the most amazing bond, that I don’t think I would have had without slings. Can you tell us one specific occasion in which using a sling had a positive impact in your daily life? Being able to help my daughter and soothe her pain. Nothing is more important to me. 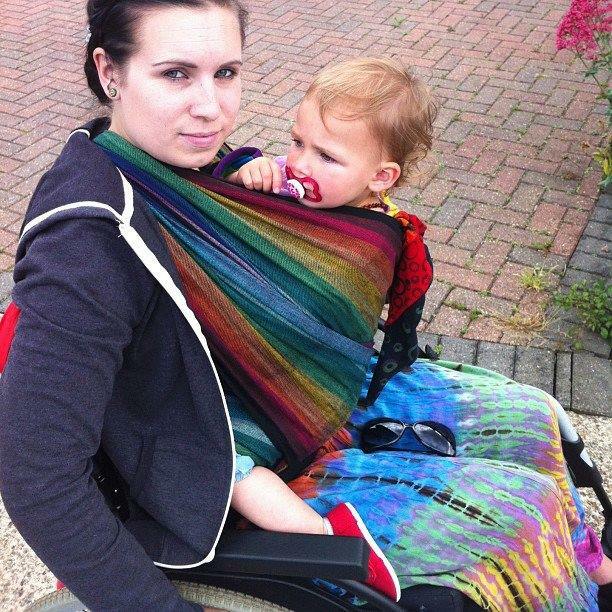 What one piece of wisdom would you pass onto other disabled parents who may be considering using slings? Quite simply do it. It opens doors, promotes independence and provides you with the freedom to bond with your child in the most amazing way.